Even after an inspection at Mumbai, the flight was given a thumbs up to continue its operation. All 130 passengers and 6 crew members on board the Aircraft were alighted safely. It was only when the plane landed in Mumbai that it was found that the main body of an aircraft was practically "destroyed". The pilot and the co-pilot of the aircraft during the incident has been suspended until the investigation is completed. The statement said airport officials at Trichy airport said the plane "might have come in contact with the airport perimeter wall". The pilot in command reported that the aircraft systems were operating normally. 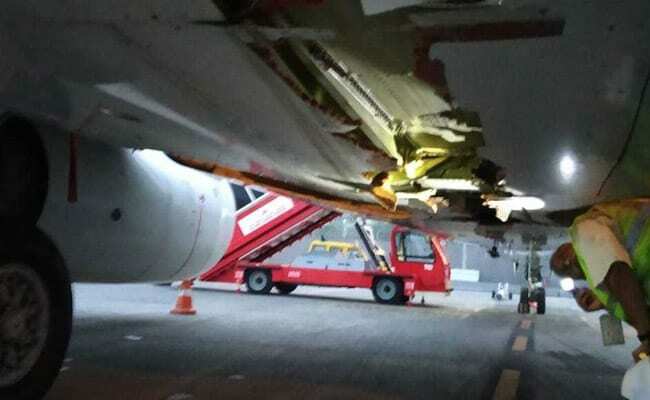 However, Dubai airport officials refused to allow the plane to land under the presumption that it was risky to allow it as the tyre had been slightly damaged, throwing the passengers on board into another round of anxiety. Data from flight-tracking service FlightRadar24 shows that the aircraft flew most of the 1,111kms from Trichy to Mumbai at regular cruising altitude of 36,000 ft.
Realising the trouble and danger, the ATC alerted the Air Indian Express authorities and the Mumbai Airport. According to the airline, the pilot in command, Captain D Ganesh Babu, has a flying experience on the B737 aircraft of 3,600 hours. "So we allowed them (to proceed)", he said. Minister of Civil Aviation Suresh Prabhu has ordered an inquiry into the incident. All passengers were deboarded and an alternative flight was arranged to take them to Dubai with a fresh set of crew. "The two pilots have been derostered pending investigation", the airline said adding that the matter had been reported to the regulator Directorate General of Civil Aviation. Tamil Nadu Tourism Minister Vellamandi N Natarajan visited Tiruchirappalli airport and inspected the accident spot.